What do I need for my new kitty? NCWL relies heavily on caring volunteers to help with tasks that the staff and directors simply do not have time for. Our team takes great pride and satisfaction in being able to save feline lives and to give them a second chance. By becoming a volunteer you can experience a feeling so great as well. NCWL accepts anyone 18 years of age or older. However, we allow high school students to volunteer either at events or in the PetSmart stores with an adult in order to help them complete their volunteer hours in which they need to graduate. Prior to becoming a Volunteer at NCWL you will have to fill out a Volunteer Application Form. Adoption Centre Volunteer - You would be working in the adoption centres in the PetSmart stores that we are partnered with. 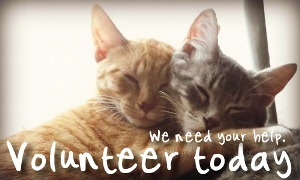 Your duties would include screening adopters, cleaning cages and providing love and exercise to the kitties. You must be mature and dedicated and able to work independently. Fundraiser Coordinator (Experience Required) - Full of ideas? Volunteer your time in arranging fundraisers, events and more. Transportation - Someone willing to dedicate their time in transporting our cats to their new forever homes and pick up any cats in need from shelters and bring them to our rescue. Transport Volunteers are in high demand. These specific volunteers allow NCWL to rescue many more cats and to help them find their way to their new families. Transport Volunteers may also bring cat(s) to and home from their veterinary appointments. *Please Note: We ask that you choose a position you will commit to and will enjoy. NCWL needs serious and honest Volunteers that will help in everything we try to do for those feline companions.